This ESL cooking conversations page has example conversations so you can see how cooking vocabulary is used, and then some tasks for you to do so you can practice using cooking words yourself. The first part of the page has two conversations that you can read that are all about cooking and eating food. They are more about going to eat in a restaurant instead and not cooking, but this is also an important part of cooking as you do not always want to eat at home and it is good to go and eat out sometimes. The conversations show what a natural exchange might be like between two native speakers. Each conversation has also been made into a short cartoon so you can watch some actions at the same time as reading the text. If you need any help with the words used in the ESL cooking conversations you can look at the vocabulary list on the ESL cooking vocabulary page. Situation: Andrew and Jane decide to go out for a meal. Andrew: Where would you like to eat? Jane: I think you should choose as we are celebrating your birthday. Andrew: I really enjoy cooking but I also look forward to letting a chef prepare a meal. Jane: You are an excellent cook but if we go out, we do not have to do the washing up. Andrew: It's difficult trying to decide where to go as there are so many good restaurants locally. Jane: We had a very good meal last week at the Chinese restaurant. Andrew: Shall we try the Indian? Jane: I prefer Thai cooking. Andrew: Thai food is delicious. I find Indian food is too spicy and the chillies burn my throat. Jane: Shall I phone the Thai restaurant and see if they have a table for us? Andrew: Yes please. What time suits you? Jane: I don't get home from work until 7 p.m., so I think 8 o'clock would be fine. Andrew: That is convenient for me too. Jane: I'll let you know if they cannot take us. If you don't hear from me I will drive round and pick you up at 7.30 p.m. tomorrow evening. Andrew: I look forward to seeing you then. Situation: Andrew and Jane enter the restaurant. Jane: I rang up and reserved a table for two to eat at 8 o'clock. My name is Jane Major. Proprietor: Welcome. Follow me. I have reserved a table for you in the window. Proprietor: Can I get you anything to drink? Jane: I am driving so I would like a tonic water. Andrew: Can I have a beer? Proprietor: Which one do you prefer? Andrew: I'd like a pint of Tetley’s. Proprietor: The menus are on the table. I'll send a waiter over to take your order when you have had time to read the menu. Andrew: There are so many dishes, it's quite over whelming. Jane: I'm going to have a starter and a main course. Andrew: I'll do the same. I think it is the Thai custom to have soup and lots of fish and vegetables. Jane: Prawns are my favourite. Andrew: I'll order a few different rice dishes and we can share the food. Jane: Here are the drinks. Happy birthday, Andy. Now, in the second part of the ESL cooking conversations page there are three exercises for you to do that will let you practice using the cooking words. Work hard and you will be able to use these exercises to help you get better at using cooking words to talk about being in a kitchen. In this ESL cooking conversation task you need to look at the following conversation and then decide which option (A-D) in each question is the best to fill the gaps in the conversation. When you have finished you can use the get score button to show the correct answers so you can see how many you got right. Situation: Andrew shows Jane how to cook rice. Andrew: There are ___________________ of rice grown in the world. Jane: What type of rice are we cooking? Andrew: This is long grained rice. It was grown in _________________. Jane: On the packet it says, easy cook. Why is it different from other sorts of rice? Andrew: That is because it is par-boiled and so takes ________________ to cook. Jane: The water in the pan is boiling. What do we do next? Andrew: Measure out enough grain for two people. Jane: It suggests 75 grams per person. Andrew: Place the rice in a sieve and wash it _________________ and then put the rice into the boiling water. Jane: Shall I stir it? Andrew: Only stir it once then put the lid on the pan and reduce the heat and simmer until __________________. Jane: How long does that take? Andrew: About 15 minutes. Then we must drain off the water, rinse with more boiling water and then we can enjoy it. Choose the best option (A-D) in the following five questions to fill in the blanks in the cooking conversation given above. A) The rice is sticky. B) The rice is tender. C) The rice turns brown. D) The rice smells good. 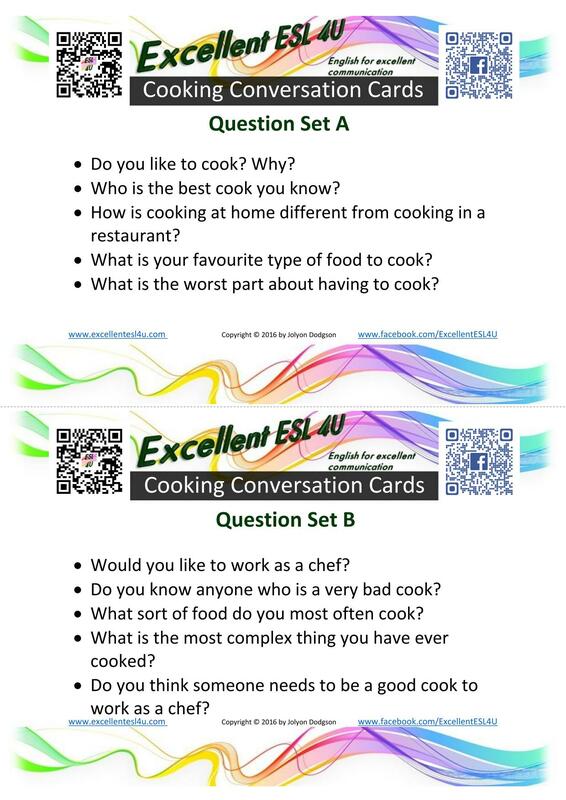 For this ESL cooking conversation activity you need to write a conversation. This should be like the example conversations given above. There should be two or more people talking about cooking. You need to write what they would say to each other. You can chose the topic as long as it is related to cooking, eating or being in a kitchen. When you have finished you can find some friends and perform the conversation so you get practice of speaking. In the last ESL cooking conversation exercise you need to have a conversation with someone about cooking. You should use the following set of conversation cards to help you as prompts for what to talk about. One person should have conversation set A and the other person should have the set B. You the take it in turns to ask your questions and listen to the answers. When you have finished the five questions on your conversation card you can swap the cards and start again. I also have a book of – 80 ESL Conversation Cards – that you can download if you would like to have even more practice of speaking. Do you like to cook? Why? How is cooking at home different from cooking in a restaurant? What is your favourite type of food to cook? What is the worst part about having to cook? Would you like to work as a chef? Do you know anyone who is a very bad cook? What sort of food do you most often cook? What is the most complex thing you have ever cooked? Do you think someone needs to be a good cook to work as a chef?